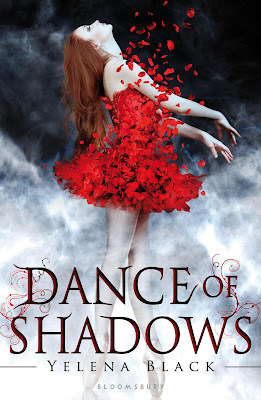 Why am I looking forward to Dance of Shadows by Yelena Black? Ballet, demons, and a gorgeous cover. I am definitely looking forward to seeing how things come together. Dance of Shadows by Yelena Black is published by Bloomsbury USA Childrens, a part of Bloomsbury/Walker, and its expected release date is December 24, 2012. Aaahhh--so excited for this one, too! Seen this a lot today, looks great I will have to read it. I've started to notice this one a lot around the blogsphere and it does sound interesting. The cover is gorgeous too but I'm not a big fan of ballet so I'm not sure I'll be reading this one. I hope you enjoy it when it comes out. This is one of my favourite covers of this year it's just so gorgeous! Demons and ballet? Sounds like a deadly (and winning) combination. Great pick! This is the second mention I've seen on this book. I am very excited for this one and it's a brand new addition to my TBR pile! This sounds like a very unique ballet book. This is the second time I've seen this one someone's WoW today, and I have officially added it to my TBR! It does look really interesting. Great pick! Looks like a popular choice today. oh, this one sounds really, really good! just added it to my tbr pile. great pick, Kristin!